Charlotte Mecklenburg Library invites you to celebrate African American History Month with FREE programs, including living history events, a local author visit, film screenings and fun and educational activities for children and teens. We’ve also compiled some great reads and resources you can use to continue learning, exploring and having conversations about the moments and people that have shaped our collective past, and provide historical context for the current issues and movements within our community. Do you know the Quilt Code? Visit West Boulevard February 21 to learn about quilt patterns believed to have been used as a communication device of the Underground Railroad, and color the patterns that tell the story. Find out how African American soldiers entered into the armed forces, how they lived, what conditions they faced and how their role was vital in both wars with Maurice Johnson, active member of the Civil War reenactment 102nd U.S. 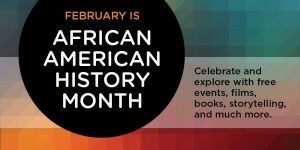 Colored Troops at several library locations throughout February. Learn about the history of West Charlotte High School and its experience of segregation, integration and re-segregation with local historian and author of Color and Character: West Charlotte High and the American Struggle over Educational Equality, Dr. Pamela Grundy, Wednesday, February 21 at University City Regional Library. Introduce little ones to important figures in African American History with picture books like The Youngest Marcher: the Story of Audrey Faye Hendricks a Young Civil Rights Activist by Cynthia Levinson, and Nina: Jazz Legend and Civil Rights Activist Nina Simon by Alice Briere-Haquet. And check out the resource Books & Authors, where you can browse the complete list of winners of the Coretta Scott King Award, which recognizes African American authors and illustrators who express the African American experience in works for young people. Young readers can learn about great figures in African American History with books like Let it Shine: Stories of Black Women Freedom Fighters by Andrea Davis Pinkney and Stephen Alcorn, and What Color is My World? The Lost History of African American Inventors by Kareem Abdul-Jabbar and Raymond Obstfeld. Find more book recommendations for children, teens and adults on the Library’s website. Hoopla offers documentaries including The Black Panthers: Vanguard of the Revolution and Brothers of the Black List, which chronicles a 1992 incident at a NY college that led to the longest-litigated civil rights case in American history. In the PBS Video Collection, you will find all 14 episodes of Eyes on the Prize, the Peabody-award-winning documentary series spanning the Civil Rights Movement in America from 1954 to 1983. If you are interested in more African American History, check out the Robinson-Spangler Carolina Room’s online exhibits, the Library of Congress’ African American History Month website and the National Museum of African American History and Culture.